If you haven’t read Part 1 of this series, you may want to read that first. A few years ago, my son went on a camping trip with his school. One evening, once the sun was gone, the kids played a game called “Mission Impossible”. The mechanics of game play don’t matter, but what does is that the kids all dressed head to toe in black in order to avoid being seen. They went to a lot of trouble to make sure they looked like everyone else and could blend into the background. Unfortunately, this is what a lot of well-meaning and talented business owners are doing to their brands. Think about the last time you were on Instagram. How many flat lay designs did you see? Probably on white marble and showing some tasteful accessories? I bet you saw lots of quotes, likely in some sort of handwriting font. Also, there’s an awful lot of pink out there. Can you remember whose pink handwritten quote belonged to whom? 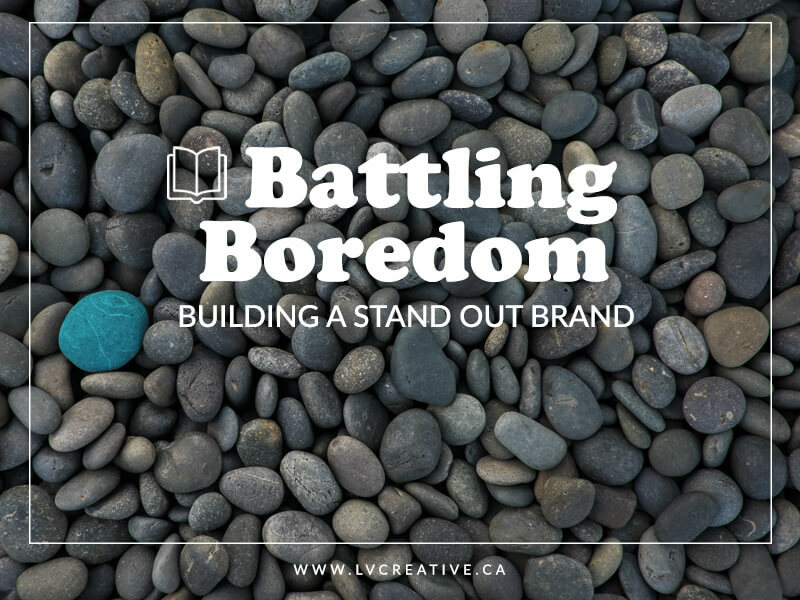 If you want to build a stand out brand, you have to defeat boredom. You need to make sure there’s something about the way you look, talk, move or interact that is definitively you. Boredom is a harsh word. If you feel like your brand is invisible, it doesn’t mean that you are boring. In fact, you probably have an amazing offer and a fascinating story. It’s more that the online marketplace, particularly social media, can be a bit of a boring place. A search on Google reveals that we see between 4,000 and 10,000 ads a day. That’s a mind-numbing amount. Combine that with who knows how many social media posts, blog articles, and opportunities to learn one more thing and it’s not at all surprising that it takes something unique to wake us up. If you want to defeat boredom, here are some places to start. Here’s where so many business owners go wrong, right out of the gate. They jump to logos and websites before they have even figured out the strategic basics. A generic why and values you can’t yet prove do not a brand strategy make. Logos and fancy websites can wait til you have a foundation to build them on. Invest in your strategy first. Assuming you have a strategy, then it’s time to start planning for your creative. It’s pretty common practice to seek out someone who is doing what you want to do. We’re all looking for road maps and the people who are leading the way seem like they have a pretty good grasp on the directions. For example, I see a lot of entrepreneurs who deeply admire Brené Brown, and it’s easy to see why. She’s an incredible thought leader with important messages and what she has to say has clearly resonated deeply with a lot of people. So it stands to reason that if your role model uses certain language or holds certain opinions, you will want to adopt them too. The problem is that building your brand around what someone else is doing shows that you’re a part of their tribe, but you’re really only bringing more attention to the hero. You aren’t distinguishing yourself or forging your own trail. Do this instead. Write down all the qualities you admire in your hero. It can be their choice of words, the colours they use, or how they always answer comments on social media. Next see if you can find some common descriptors among those qualities. So for our Brené Brown example, you may list words like “wise”, “funny”, and “down-to-earth”. Use those words as the basis for creating your own brand style. You’ll be able to forge your own path by leveraging a foundation that has special meaning for you, but you can make it entirely your own. Designers are forever asking their clients to send examples of what they like or don’t like. Entrepreneurs definitely spend a good portion of time looking at what their competitors are doing so inevitably the likes/dislikes list comes from within their own industry. This is a great place to start but getting outside your industry is where you find the gold. If you want to build a stand out brand, start looking for inspiration in unexpected places. You can find amazing textures in fashion magazines, colours in greeting cards, or typography choices at the library. I’m never without my phone so when I see something that might work for myself or one of my clients, I quickly snap a photo and save it to a Pinterest board. Start widening your view and you’ll be surprised what you might find. If building your own style seems overwhelming, start by choosing one element. Maybe you decide you want to own the colour purple. (This works even better if the bulk of your industry is using something else.) If you pick one thing, you need to really double down on it. All your social media posts, your advertising and your website has to heavily feature this colour. It doesn’t have to be a colour. You can choose a shape or a favourite font or decide that every image you post is going to be a selfie. As long as it’s something you’re willing to commit to, go for it. Stay the course. It takes a while to build a recognizable visual brand. Branding is very hard to do in a vacuum and it’s even harder to do for yourself. If you feel like you just keep running up against dead ends, it might be time to get some help. If your brand feels like a million disparate pieces and you just don’t know how to pull them all together, book a free chat and let’s see if I can help. Have you been successful building a style for your brand? Tell me how you went about it in the comments.